Yellowstone National Park is planning to implement some temporary fishing closures. Hot air temperatures, limited rainfall, runoff from thermal features, and below average stream flows have all resulted in high water temperatures in these rivers. Water temperatures in the Gibbon River have been above 73 degrees most of the past two weeks, with water temperatures in the Firehole River above 78 degrees temperature. Water temperatures this warm can be stressful and even fatal for trout. Yellowstone National Park staff will continue to monitor water temperatures and stream flows in these and other rivers and streams throughout the park. The extended forecast calls for continued hot and dry conditions with a slight chance of isolated afternoon thunderstorms. 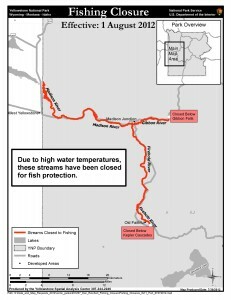 These conditions contribute to continued low stream flows and high water temperatures, and could result in additional fishing restrictions.